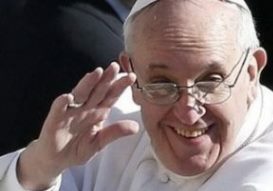 It's now been over three months since the Catholic Church has officially had two popes with Pope Benedict stepping down while Pope Francis has stepped up. Although only one holds authority over the Holy See, for all intents and purposes we've now got two, two, two popes in one! to paraphrase a well-known breath mint/candy mint commercial from long ago. TV producers have predictably lost no time in exploiting this turn of events to develop a sitcom based on the dual pope premise. Although the program's name is not decided --- candidates include The Odd Prelates, Two and a Half Popes Minus a Half, and Two Broke Popes --- the theme song is already fixed. From Avignon to St. Peter's Square. Identical pontiffs all the way. Different as clergy and lay. You can lose you mind! When pontiffs are two of a kind! Here's hoping the new show will be a big hit and run for many, many successful years! If you liked this post you might also like The Pope's Tweets, That President!, and Meet the Beatles, Mr. Zuckerberg. If you hated this post, I'm afraid there's precious little in heaven or earth either of the two popes can do to help you. And don't expect me to lift a bejeweled finger for you either! Who's doing the wardrobe ? Who cares about the wardrobes, who's playing the part? Somebody dazzling, flamboyant, and simply stunning! Too bad Liberace isn't around. I hope there's a guest appearance by the Flying Nun. Not touching that one, me boy! Whatever it is that's got her flying, order two more for the two broke popes! Summertime for the Secular, or Jewish Enough? The Wheels on the Bus Go "Carp, Carp, Carp"